Trains are THE BEST. We love to do train art projects and make trains snacks and of course, read books about trains. For our Weekly Virtual Book Club for Kids this week we are featuring The Polar Express by Chris Van Allsburg and we are doing some train pretend play! We are so excited that it is TRAIN WEEK! 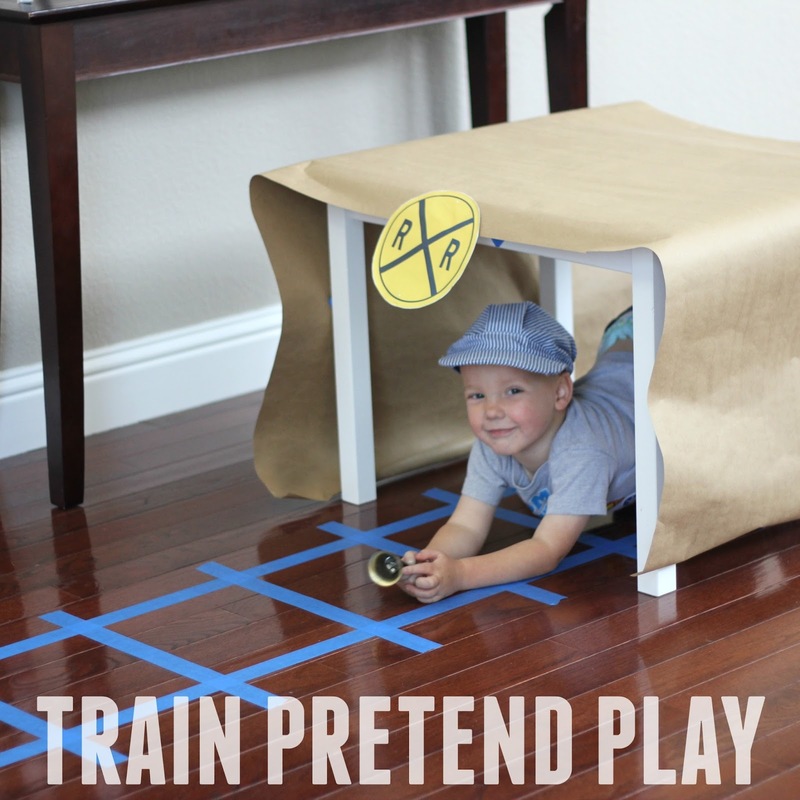 To do some train pretend play all you need are some chairs or boxes or a little table. We made a little train tunnel and chair train when we had some friends over and the kids had so much fun! 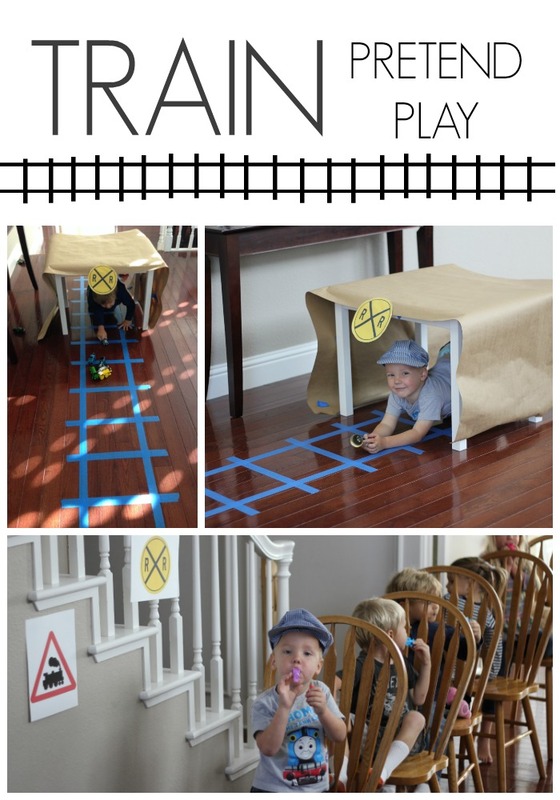 HOW TO SET UP TRAIN PRETEND PLAY FUN! You can set up a train pretend play area however you'd like based on your kid's input and creativity, but here's what we did to get your creative juices flowing. First, we cut a long piece of brown postal wrapping paper and laid it on top of our little white kids table. Next we taped it in place with painter's tape and we printed out some train signs. We stuck the train signs on the tunnel and walls. After that we took some painters tape and laid it out on the floor to make a giant train track. The kids loved pretending to be trains, putting boxes through the tunnel that looked like trains, and driving their Thomas trains through the tunnel. We also grabbed some train conductor hats, train whistles, and kitchen chairs and we made ourselves a giant train! The kids took turns being the conductor, the ticket collectors, and the passengers. Train pretend play is awesome! Last night we made a super long train in our living room using kitchen chairs and we used our projector to project The Polar Express on the wall! We had a pizza party, drank hot cocoa, and watched the movie. The kids pretended that they were riding the train as well and it was so fabulous! Have you ever done train pretend play with your kids? If so, what are your favorite props or materials to use? We need to get a train conductor costume! In addition to this fun train pretend play activity, our Weekly Virtual Book Club for Kids co-hosts are sharing several other fun activities this week! Scroll down to check them out! I love this idea! Thanks Kristina! My daughter loves trains and this is such a simple and creative way to explore the railways. This is definitely on my to-do list!